The Mile High City is more than a gateway to the mountains. A flourishing cultural district, amazing dining, and a booming beer scene make it a city you’ll want to spend time exploring. Boxcar Coffee Roasters. Start your morning off right at a café whose masterminds came up with a brewing method geared specifically to high altitudes. $; 3350 Brighton Blvd.; . Park Burger. Stop here for lunch and pair a Royale burger (blue cheese and bacon) with an ice-cold beer on the patio. $; 211 S. Holly St.; . Rioja. The menu is seasonal and consistently interesting, with must-try dishes like the pork belly appetizer served on a bed of curried chickpeas. And as always, it’s accompanied by the best selection of breads, butters, and salts. It’s no wonder the restaurant won a James Beard award for Best Chef Southwest in 2013. $$$; 1431 Larimer St.; . Green Russell. It’s got all the marks of a speakeasy: the ambiguous sign, an entrance through the back door of a pie shop, and that feeling that you’ve just stumbled into something top secret. But Green Russell is more like fine dining—for cocktails, with mixologists who are more like chefs. $; 1422 Larimer St.; . Little Man Ice Cream. On sunny days, Little Man becomes LoHi’s de facto town square, serving handmade ice cream, sorbet, and gelato beneath the shop’s distinctive giant milk-jug edifice. $; 2620 16th St.; . LoHi SteakBar. Come for Colorado microbrews and the amazing El Tejon burger, with fried egg, chili, and cheddar. $$; 3200 Tejon St.; . Williams & Graham. You could try the Smokey Mountain Cocktail, made with honey vodka, habanero juice, and mezcal, which is smoky, hot, and sweet all at once, or just ask bartender Jason Patz to make something to your taste. He experiments with flavors in the same way an artist might with colors. $$; 3160 Tejon St.; . Denver Beer Co. A simple brewpub with bench seats and a big patio. It’s all about the beer, nothing more. Try the graham cracker porter—dark and smooth with a nutty, clean finish. They also bring in food trucks so you can grab a bite between sips. $; 1695 Platte St.; . Buckhorn Exchange. Step into the two-story brick tavern, and you’re back on the frontier. The menu stars the signature prime beef steaks, plus buffalo and other game, served in a dining room filled with more than 500 pieces of taxidermy. The upstairs bar is the best place to nurse a glass of whiskey during performances by singing cowboys. $$$$; 1000 Osage St.; . Ace. Southeast Asian snacks + cocktails + ping-pong? Game on! Come hungry for the bao buns, tiger wings, and dumplings, all washed down with cocktails like the Girl with Green Eyes, made with St. Germain, lime, and Thai chile sugar. When your chopsticks need a rest, there’s a wicked game of ping-pong waiting for you at one of the 10 regulation-size tables. $$; 501 E. 17th Ave.; . Hotel Teatro. If Marie Antoinette had made it to Colorado, this is where she’d stay. The historic hotel in the thick of the theater district has remodeled rooms with cherry finishes and luxe bathrooms, plus a staff who anticipate needs you didn’t know you had. $$$; 1100 14th St.; . Brown Palace Hotel. The grand dame of Denver lodging, it emanates an Old World feel with its ornate lobby and classic rooms and furnishings. It’s the kind of place you go to celebrate an anniversary, birthday, or other special occasion—and leave the kids at home. $$; 321 17th St.; . Four Seasons Hotel Denver. Rooms at the Four Seasons downtown have killer skyline and Rocky Mountain views, plus you can order drinks and bites on the rooftop poolside terrace. When you’re ready to leave this oasis, you’ll find Denver’s Theatre District at your doorstep. $$$$; 1111 14th St.; . Hotel Monaco Denver. Bright, bold colors mixed among contrasting patterns, from paisley to cow hide, make the unconventional rooms in this downtown hotel some of the most desirable in town. The complimentary daily wine hour held in the elaborate lobby, the pet-friendly policy, and leopard-print robes in each room don’t hurt either. $$; 1717 Champa St.; . The Curtis. One of Denver’s quirkiest stays, each of the hotel’s 13 floors has a different theme, from TV Mania (14th floor) to One Hit Wonder (5th floor). While rooms are on the smaller side, the Curtis is no doubt one of the most fun hotels among the downtown lodging scene. $$; 1405 Curtis St.; . Denver Museum of Nature & Science. It offers one of the city’s most diverse—and fun—learning experiences. Don’t miss the gems exhibit, which highlights some of the state’s most revered possessions, or the Prehistoric Journey, which transports you through eons from the world’s first organisms to the present. $$; 2001 Colorado Blvd.; . Denver Botanic Gardens. An updated greenhouse complex means you can peek inside the massive glass structures for a behind-the-scenes look at horticulturists hard at work. Kids will love the Mordecai Children’s Garden, where they can build forts, splash around in the stream, and explore plant and insect life. $$; 1007 York St.; . Clyfford Still Museum. Pollock and Rothko tend to get all the love, but a visit here will convince you that Still deserves to share the stage. There are nine galleries, all devoted to Still’s works, many of which have never been seen before. Wander the halls and stare at the monumental color-splashed canvases; the space is designed to show them off in different shadow and light. $$; 1250 Bannock St.; . Red Rocks Park and Amphitheatre. Although it’s located in Golden, about 15 miles southwest of town, it’s worth the trip. Go for a show, to get a great workout climbing the stands, or to just walk around and feel the space. No matter what you’re there for, it’s a breathtaking experience—the stadium-size arena opens up to a captivating mountain scene. $–$$$; 18300 W. Alameda Pkwy.; . Commons Park. A quiet oasis at any time of year, it’s the perfect place for a bike ride. Pick up a bike-share bike at one of the dozens of Denver B-Cycle stations (find a map at ), then pedal around to your heart’s content. Along the South Platte River, trails thread east, where sculptures lead to an elm- and cottonwood-lined promenade along the high-rises. 2101 15th St. Tattered Cover Book Store. The iconic shop is a great combination of the place you want to hang out in for an hour or two, and a store where you can find anything you’re looking for quickly. It features readings by lots of local authors, and there are always books on hand about the environment and the West. $; 2526 E. Colfax Ave.; . I Heart Denver. Although this store started as a pop-up in 2010 touting local creative talent, it eventually found permanent downtown digs. Now stocking the wares of more than 130 artists, it screams hometown pride, with onesies emblazoned with “Made in Colorado” and tea towels block-printed with Rocky Mountain-inspired motifs. $$; 500 16th St.; . Ironwood. A curated curiosity cabinet of a store. Pieces made by an artist or a 19th-century cartographer are all mixed together. Look for air plants and locally made jewelry. $$; 14 S. Broadway; . Wilderness Exchange Unlimited. Like a toy store for adventure seekers, it has some of the best prices in town on a mind-boggling array of new and used rugged clothing, backpacks, sleeping bags, hiking gear, and gizmos. $$; 2401 15th St.; . 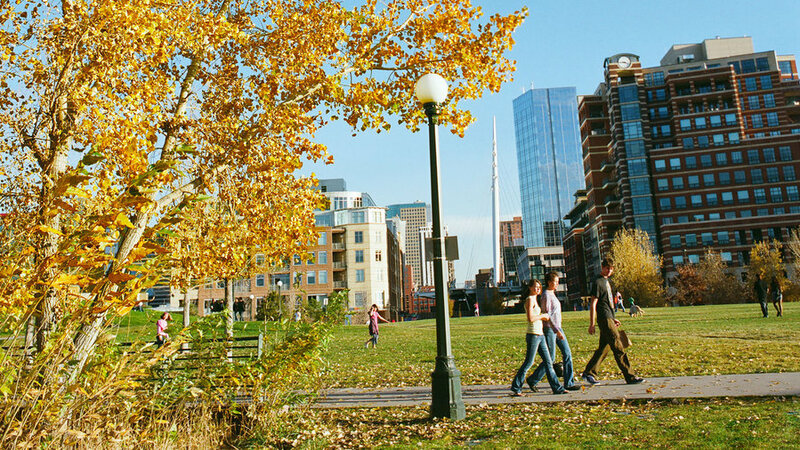 For more things to do, check out our Insider Guide to Denver.